Hanoi (VNA) – Provinces and cities in northern Vietnam have been requested to prepare to deal with flood and landslides in the region. In a notice sent to localities, ministries, Vietnam News Agency (VNA), Vietnam Television (VTV) and Radio the Voice of Vietnam (VOV), the Central Steering Committee for Natural Disaster Prevention and Control said that rainstorms may occur from August 13-16 in the northern region, especially in mountainous provinces. 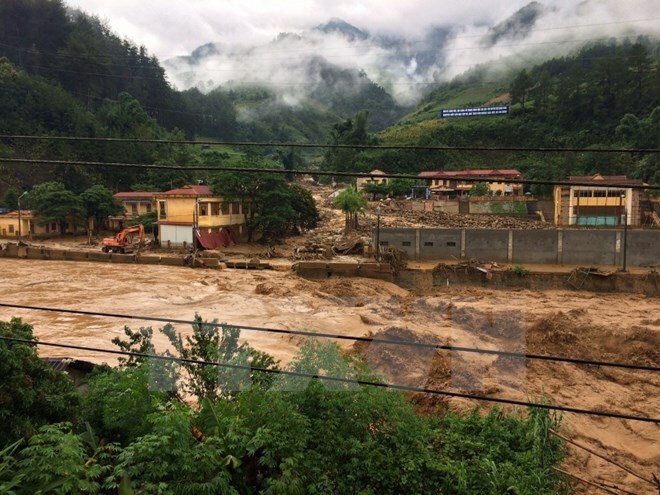 The steering committee warned Lai Chau, Son La, Dien Bien, Lao Cai, Yen Bai, Ha Giang, Tuyen Quang, Cao Bang and Bac Kan provinces of high risks of landslides and flash floods. To minimise human and property losses, it asked local steering boards of natural disaster prevention and control and search and rescue to assign their members to focus on areas at risk of landslides and flash floods and that are easily cut off by floods. Localities were asked to monitor rain and flood developments and spread information to locals, especially those vulnerable to natural disasters, to implement preventive measures. Search and rescue forces have to be ready around the clock in high-risk areas to take action if disasters occur, the steering committee noted. The VNA, VTV, and VOV, as well as news and media agencies of the localities were requested to increase coverage of disaster-related information and skills to deal with torrential rains and floods. According to the Central Steering Committee for Natural Disaster Prevention and Control, since the beginning of August, heavy rains and flash floods have claimed at least 34 lives and left 11 others missing and more than 20 injured.